Facility managers are often brought into the planning and design phases of a construction project far too late, if at all. DIRTT Environmental Solutions, and others like it, can help change this. Facility managers are often brought into the planning and design phases of a construction project far too late, if at all. Yet, these are the people responsible for integrating the maintenance of the facility itself with the processes and people within it. They understand how the space will need to function, the rigors of routine maintenance, who will use the space, how it will be used, and the implications of design decisions. Facility managers must be viewed as key decision makers at the outset of a construction project. What can support this need? Technology that helps communicate design plans to stakeholders, with the hard numbers and data necessary to achieve buy-in at the top level. “The reality is that most facility departments are often kept more than an arm’s length from the design and construction phases and are brought in too late into the project to adequately prepare for a successful hand-off,” he said. The reality is that most facility departments are often kept more than an arm’s length from the design and construction phases and are brought in too late into the project to adequately prepare for a successful hand-off. But now there’s a solution: technology, like DIRTT’s ICE Software, turns construction into an interactive, 3D experience, with the built-in intelligence to instantly calculate detailed pricing, timelines, and all the necessary data for the manufacturing factory. This tech is already being used today by some prefab construction manufacturers. With it, every phase of construction becomes part of an integrated process, from planning to manufacturing to installation. While 3D and photo-realistic envisioning tools are nothing new, old technology doesn’t allow for changes to be made on the fly and doesn’t provide the data required in order to move forward and make decisions about cost and timeline. These tools lack any form of intelligence, until now. For the first time, there’s a link between end user and facilities teams, the manufacturing floor, and the final project. Key stakeholders understand design and implications without having to decipher line drawings, site plans, or data charts. Changes to any aspect of the design can be made instantly and are immediately reflected in pricing, data, and schedules. The technology tells the manufacturing floor exactly what’s needed, and project components are manufactured in an off-site environment for consistency and quality. They can arrive on site within four weeks of finalizing an order, in the sizes specified with finishes already applied. From the very outset of a project, facilities managers can be looked to for their experience as they connect design plans with the long-term post-construction needs of that space and the people within it. They can identify potential issues or inefficiencies before they become costly problems, and with 3D visuals and hard numbers, can subsequently communicate plans to achieve buy-in from necessary parties from the get-go. 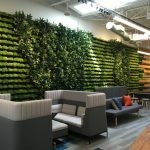 DIRTT Environmental Solutions uses this type of technology to design every interior construction component to enable fast, clean, and non-disruptive maintenance and changes at any time, now or in the future. For facility managers strategically thinking of the longer-term space requirements, it’s an incomparable advantage. Walls are built on a tile-based system (see above) so facilities teams can access the inner wall cavity for updates and routine maintenance of utilities, technologies, power and data without the dust and noise common with drywall. The space remains relevant and effective well into the future. How does this technology and construction method affect a project budget and what’s the impact on facilities teams? The technology enables all projects to be custom while being charged according to the amount of materials used, not according to deviations from a standard offering, so it can actually cost less when you look at the project as a whole. Conventional builders spend approximately 70 percent of the project budget on labor, contingencies, fees, and conditions, with just 30 percent left for materials. When value engineering affects a project, the only way to stay within budget is to lessen the quality of the materials, as labor cost reductions are seldom realized. However, with the speed, labor mitigation, and precision of a technology-backed prefab method, that budget equation is flipped. The clients instead see 70 percent of their budget going to value-engineered-in materials and the remaining 30 percent for labor. Facilities teams get to work with higher quality, durable materials that offer better performance, aesthetics, and flexibility in the long run. Facility managers can become an essential part of the construction project from the start, when they’re armed with a tool that helps them achieve project buy-in with accurate data, precise timelines and intelligent visual communications. The end result is a space connected to the strategy and goals of the business and its users, and one that supports facilities teams in the daily and long-term requirements of their position. This post was sponsored by DIRTT.